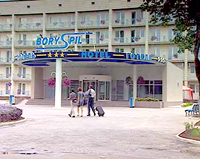 Borispol International Airport travelers who are scheduled for an overnight layover, a long layover or simply a delayed flight will want to take advantage of the Airport Borispol Hotel. Located only a short 100 yards from the entrance of the Borispol International Airport Kiev Ukraine, the hotel is clean and close. If you are in need of sleep and a shower this is your destination. Often, a taxi to the Kiev city center may cost as much as $50 from the local taxi drivers so, if sight seeing is not on your agenda, the same money will get you off the street and out of the weather. The hotel features 134 rooms, all with Satellite TV, Telephone, Shower/ bath, and Refrigerator.